While I was out of town on the weekend I had a good chance to start stitching some of my white hexies together. I made my first row and bit on the way to and from Banff. I laid out the first row on my queen sized bed when I got home and decided 33 is the right number to go across. 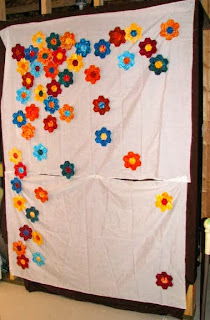 After stitching the first row I decided it was time to redo my design layout of the flowers. Ever since doing it the first time I felt there was a couple flowers that were out of place, and that the whole idea needed to be mirrored. I was picturing the flowers falling toward the bottom left corner of the bed, and the way they were laid out they were falling to the right. Silly I know. But I had to change it for my own piece of mind. After, minus the top blue flower. 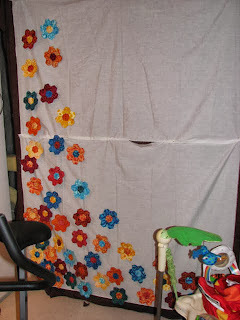 I added the top flower to the first row, then started adding my second and third rows. 2 and half rows done. Pretty blue flower for the top of quilt. 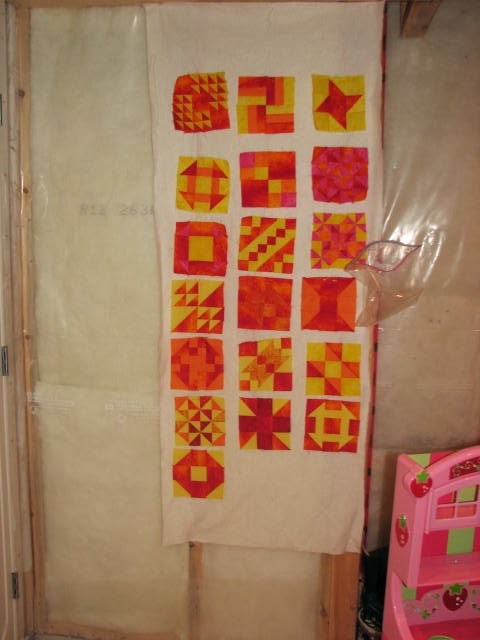 I will need to make some half hexies soon so that I can feel like the rows are actually finished as I add them. And I still need to baste lots more white hexies. Anyway, thanks for stopping by to have look. I am linking up with Freshly Pieced. I really like those blocks and the hexies look so fabulous! Great job putting so many together! I love the colours of your Farmer's Wife blocks - so summery and fun! Thank you. They are definitely my favourite colors and it is making it so much fun to sew.